Pay-Per-Click (PPC) Marketing or "Sponsored Ads" are paid links placed in search engines at the top and right side of the search results page. This is the fastest way to get your site out in front of highly desired target markets based on keyword searches. You can set your own daily budget to know approximately how much your monthly advertising will cost at all times. Each keyword or keyword phrase has a different bid amount depending on the monthly search volume. The higher the search volume, the higher the minimum bid amount. Sponsored Ads will help increase your visibility to potential customers while helping build traffic through the search engines. Not to mention a higher conversion rate. Top positions on the page are typically reserved for pay-per-click sponsors (Google AdWords, Microsoft adCenter). Traffic can often be sent to a specific page within your website, other than your home page. Inexpensive - low to no start up costs. Quick processing time allows it to be used for short-term promotions or seasonal business. Allows one to target lower search volume phrases inexpensively. Set daily and/or monthly budgets so you know approximately the maximum amount that your advertising would cost. "Click to Call" phone numbers in Google AdWords on Mobile Devices. Your phone number can show at the end of the ad for ease of contact you. Adjustments of daily and/or monthly budget to make sure you are getting the most out of your advertising. Traffic can often be sent to a specific page within your website, other than your home page. We make sure your ad has a good quality score. Strategically editing bid amounts for each keyword or keyword phrase since bid amounts depend on the monthly search volume. This is something that is always changing. You could have your ad showing one month, but not the next month because the bids have moved up. You would not know this unless you constantly analyzed your ad campaign. 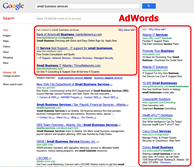 Having a great ad could help you just as much as a great keyword or phrase. We comprise a very detailed ad that is relevant to your keyword or keyword phrase and landing page to achieve highest possible ROI. We optimize your ads to only show in geographic locations or areas that are relative to your business. For example, a local landscape company in Atlanta would not want their ads showing to people in California with the potential to be clicked on. This would end up wasting your budget and not reaching the appropriate target market. Contact Us about Pay-Per-Click Services!